It’s ten years later, and as promised the Junior Counselors are back for a reunion at 9:30AM sharp. Everyone is pretty much the same, except for Ben, who’s had a nose-job that has changed his appearance from Bradley Cooper to Adam Scott. Camp Firewood hasn’t changed much either over the years, as there are still stories about Willie S**ts His Pants, and some of the returning cast haven’t grown up a bit, still acting as teenagers and immature children. Michael Showalter continues his multitasking as Coop and now former President Reagan, as he works with Michael Ian Black’s President Bush (Sr.), all while keeping an eye on the up-and-coming Arizona Senator who plays saxophone. Having a film is like having a baby. They are also very self-aware, referencing episode numbers within the show, and like the original, they play on the times, with references to Blockbuster, Circuit City and B. Dalton Books. 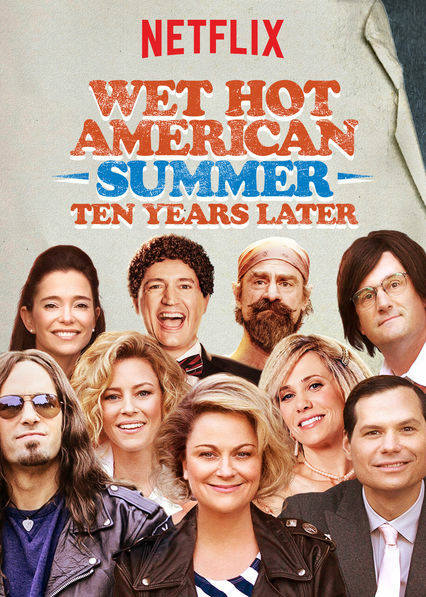 The show is star studded, including Amy Poehler, Paul Rudd, Elizabeth Banks, Alyssa Milano, Joe Lo Truglio, Chris Pine, and David Hyde Pierce. It was funny and and enjoyable, and the show may miss the mark from the original series, but still gets a 7.5 out of 10, but let’s stop now and not push this series any further.